In the previous section we reviewed several aspects of the Transport Layer. We learned a great deal of information; covering sockets, ports, TCP, UDP, segments, and datagrams. Now we will take a look at the fourth and final layer of the TCP/IP stack: the Application Layer. What Does The Application Layer Do? A lot of newcomers to TCP/IP wonder why an Application Layer is needed, since the Transport Layer handles a lot of interfacing between the network and applications. While this is true, the Application Layer focuses more on network services, APIs, utilities, and operating system environments. If you know the TCP/IP stack and OSI model well enough, you’ll know that there are three OSI model layers that correspond to the TCP/IP Application Layer. By breaking the TCP/IP Application Layer into three separate layers, we can better understand what responsibilities the Application Layer actually has. 1. Application Layer – The seventh OSI model layer (which shouldn’t be confused with the TCP/IP stack’s Application Layer). It supports network access, as well as provides services for user applications. 2. Presentation Layer – The Sixth OSI model layer is the Presentation Layer. It translates data into a format that can be read by many platforms. With all the different operating systems, programs, and protocols floating around, this is a good feature to have. It also has support for security encryption and data compression. 3. 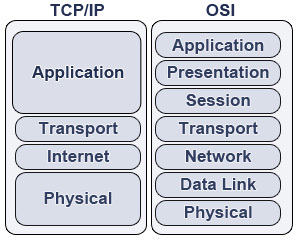 Session Layer – The fifth layer of the OSI model is the Session Layer. It manages communication between applications on a network, and is usually used particularly for streaming media or using web conferencing. To better grasp the concepts of the Application Layer, we’ll take a look at a few examples of the Application Layer in action. If you aren’t hip on the nerdy lingo- don’t worry: an API simply stands for Application Programming Interface. An API is just a collection of functions that allows programs to access an internal environment. A good example of an API is DirectX. If you’ve ever run a multimedia application and used Windows at the same time, odds are you have come into contact with DirectX. DirectX is made up of many different components that allow programmers to create multimedia applications (such as video games). The Application Layer handles network services; most notably file and printing, name resolution, and redirector services. Name resolution is the process of mapping an IP address to a human-readable name. You may be familiar with the name Google more so than the IP address of Google. Without name resolution, we would have to remember four octets of numbers for each website we wanted to visit- not very friendly is it? A redirector, otherwise known as a requester, is a service that is largely taken for granted. It is a handy little service that looks at requests a user may make: if it can be fulfilled locally, it is done so. If the request requires a redirection to another computer, then the request is forwarded onto another machine. This enables users to access network resources just like they were an integral part of the local system. A user could browse files on another computer just like they were located on the local computer- obviously redirector services are fairly powerful. Lastly we have file and print services. If a computer needs to access a file server or a printer, these services will allow the computer to do so. It is fairly self-explanatory, but worth reviewing nonetheless. This is where most people have experience- within the network utilities section of the Application Layer. Every time you use a Ping, Arp, or Traceroute command, you are taking full advantage of the Application Layer. It’s quite convenient that the Application Layer is located on the top of the TCP/IP stack. We can send a Ping and, if successful, can verify that the TCP/IP stack is successfully functioning. It’s a good idea to commit each utility to memory, as they are very useful for maintaining, configuring, and troubleshooting networks. Listed below are seven of the most used utilities. 1. ARP – Arp stands for Address Resolution Protocol. It is used to map an IP address to a physical address found on your NIC card. Using this command can tell us what physical address belongs to which IP address. 2. Netstat – Netstat is a handy tool that displays local and remote connections to the computer. It displays IP addresses, ports, protocol being used, and the status of the connection. 3. Ping – Ping is a simple diagnostic tool that can check for connectivity between two points on a network. It is one of the most used TCP/IP utilities when setting up a network or changing network settings. 4. TraceRT – Tracert, or traceroute, is a command that will show the path that packets of data take while being sent. It’s handy for checking to see where a possible network failure lies, or even for ensuring that data packets are taking the fastest route possible on a network. 5. FTP / TFTP – FTP and TFTP are both used for transferring files. It is important to note that FTP is a TCP utility, while TFTP is a UDP utility. TFTP tends to be less secure than FTP, and is generally only used for transferring non-confidential files over a network when speed is concerned. 6. Hostname – Hostname is a simple command that displays the hostname of the current computer. Simple, yet effective. 7. Whois – Whois information is just like an online phonebook. It shows the contact information for owners of a particular domain. By using a Whois search, you will find that Google is based in California. The Application Layer isn’t as exciting as the others. We don’t really have much physical interaction with the Application layer, and most of the fun applies to developers and geeks only. Thanks for the overview on the application layer. You should write college text books with your style of explaining things, because the one I have looks and reads like someone from the Geek squad wrote it. Thanks for the insight about networking, I agree with a previous comment you should write a book seriously. I have Microsoft networking trainign next week and will use all this as a reference. could you please provide an overview on CSMA..? This was very helpful to me in understanding the last layer of the OSI model. I had read short meanings of what the layer does, but it meant nothing to me. After reading this site, I definately understand now what handling network services actually means. whats the advantages and disadvantages of tcp-ip application layer compair to the cobination of presntation and session layer in osi layer? and in the other hand osi model layers presentation and session layers are more reliable and acurate than the equalnt aplication layer in tcp-ip? can i know answer this question? give some advantages & disadvantages of combining the session, presentation and application layer in tcp/ip model. I found details of the OSI model layers 1-4 headers, but couldn’t find any details on layers 5-7 headers. i.e. I found details on the TCP and IP packet headers, but nothing on the upper layers. Can you help?